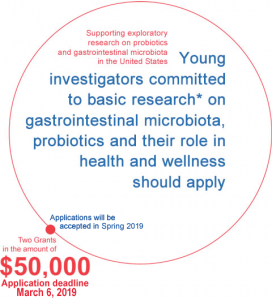 * Basic research can involve bacteria, cell lines, derived cells or animal models, but does not involve clinical studies in human subjects. However, it can include research on human specimens and ad hoc studies on existing cohorts. Applications due Friday, March 15th. 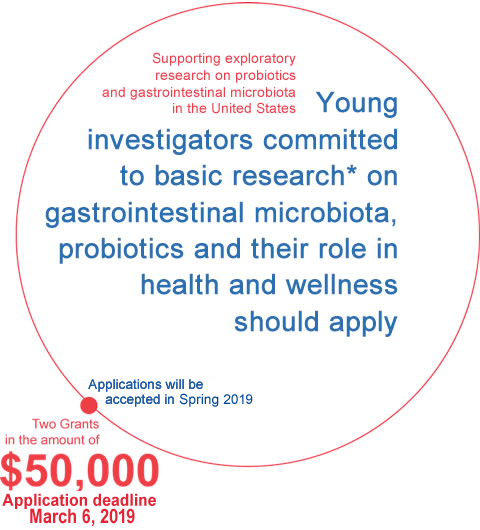 The purpose of the Young Investigator Grant for Probiotic Research is to contribute to the advancement of probiotics and gastrointestinal microbiota research in the United States and to impact academic and career development of young investigators, attracting them into the field of probiotics and microbiota. The grants will be awarded at the sole discretion of the Independent Selection Committee.